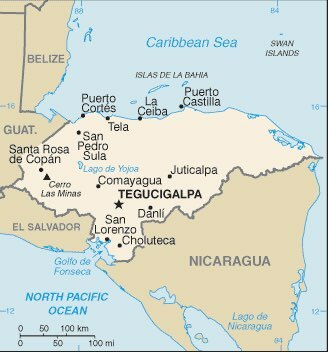 Honduras : When and where to go? The tropical climate divides the year into two seasons, a dry season that corresponds to summer, between November and April, and a rainy, winter, which lasts from May to October, with high temperatures and heavy humidity. There may be cyclones on the coast. The best season to visit the country is winter, with the exception of the Caribbean coast which is more pleasant from March to May. You will be able to start by visiting the capital, Tegucigalpa, at the bottom of its valley, a lively and bustling city, at 1000 meters of altitude, you will appreciate the mild and fresh climate: to see, its cathedral of the 18th century Modern art housed in the old university, the Palacio Legislativo on stilts. A few kilometers from the city you will find the basilica of Suyapa, the colonial city of Santa Lucia, as well as the Tigra National Park, a luxuriant reserve where pumas, monkeys, ocelots and quetzals live. Other sites to explore: Comayaga, former capital, with its cathedral and colonial museum; The beautiful village of Copan Ruinas, with its white houses with red tiles and its Maya archaeological site, as well as hot springs a few kilometers away; The seaside town of Tela, with beautiful beaches; The Bahia archipelago, made up of three islands 50 km from the north coast, which boasts superb diving sites; The wilderness of the Mosquita, northeast, where is found a varied fauna, alligators, manatees, monkeys and many birds. Not to be missed is the Punta Sal Marine National Park, where you can admire swamps and mangrove forests, tropical vegetation and rocky peaks, all completely wild (food and tent) after a two-day trip that ends on foot. You need a passport valid for another 6 months to enter Honduras, and a visa if you stay there for more than 90 days. The current currency is the lempira (HNL). There is no direct flight from France, you will make a stopover in North America or Latin America to land at the Tegucigalpa International Airport. For travel within the country, it is possible to rent a car or a motorbike, and even a bike, but pay attention to the state of the roads. Travel by bus is not advised by the Ministry of Foreign Affairs because of thefts or attacks, but some companies are less risky than others. In addition, domestic airlines have emerged in recent years, which allow you to rally the major cities. In cities, you will find taxis easily, but they do not have counters. Budget issue, Honduras is a country where life is inexpensive, although prices are higher in tourist areas during the summer. You will be able to stay for about twenty euros per night, and eat for about 5 €, even less if you take a traditional dish. Health: there are no compulsory vaccinations, but you are advised to have your universal vaccinations up to date. Also, do not drink tap water without purifying it with proper sealants, and only eat well-washed, peeled, or cooked fruits and vegetables. The mosquitoes are very virulent, you absolutely must protect yourself, even if malaria is not very common in the country. Dengue may be very present during the rainy season. Security: considered one of the most dangerous countries in the world, Honduras limits its safe tourist areas to the Bay Islands and Tiger Island. The delinquency is very strong especially in the cities and you must take great precautions (see on the website of the Ministry of Foreign Affairs). Cyclones are another real risk during the rainy season, so check the weather before planning a trip on the spot. Shopping: you can bring in souvenirs of rum or coffee, naive paintings, bronze or silver jewelery, ceramic figurines or mahogany sculptures adorned with Mayan motifs.